Warning:Lock pin must be secured into the bench fixture to hold thetransmission and prevent bodily injury. Note:Ensure the DT 3289-20 holding fixture is mounted to a bench that is properly supported and will support the weight of thetransmission assembly without tipping. DT-39890 holding fixture adapter adapter and an engine stand can be used as an alternative method for supporting thetransmissionassembly during repairs. Caution:Only install the lift assist handles until it stops. Do nottighten. Over tightening the lift assist handles can cause damageto the torque converter. 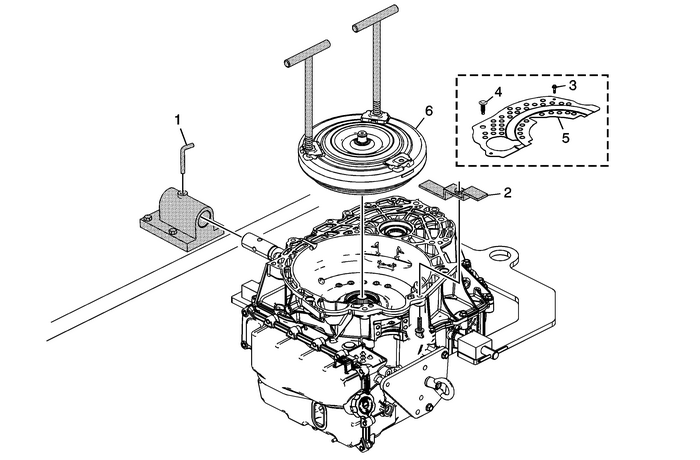 Note:Failure to raise the torque converter straight up could damage the torque converterclutch lip seal inside the torque converter clutch assembly.